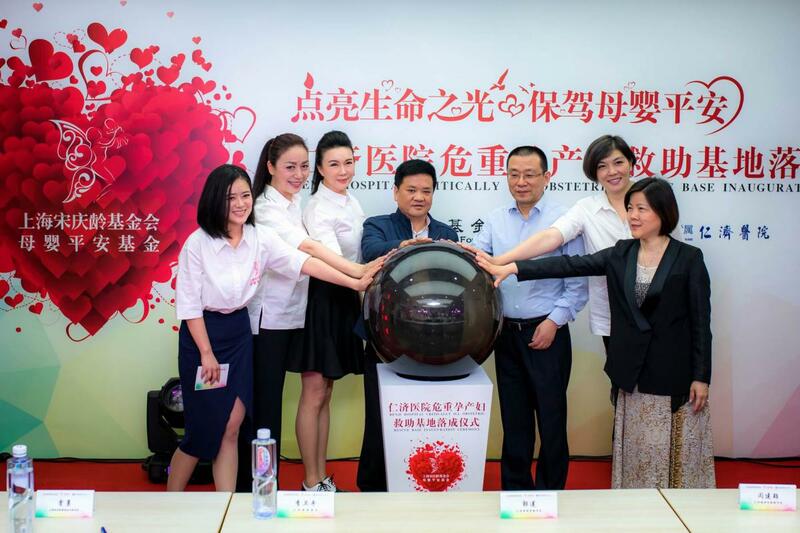 The Renji Hospital Critically Ill Obstetrical Base, set up by SSCLF- Safety for Mothers and Infants Fund, was inaugurated in Renji Hospital affiliated to School of Medicine, Shanghai Jiaotong University on the afternoon of May 24. The established base will bear all or part of the maternal and neonate rescue fees and follow-up treatment costs to provide strong social support system and appropriate economic aid for the needy and high-risk pregnant women. The Renji hospital has set up the first center for diagnosis and treatment of high-risk pregnant women in Shanghai since early 1980’. In 2007, the hospital became the first batch of emergency centers in Shanghai to undertake a large number of critically ill pregnant women consultations and rescue work. According to the statistics given by Shanghai Women Health Care Center, the number of high-risk pregnant women rescued by Renji Hospital in 2016 accounted for 40% of all the high-risk pregnant women in Shanghai, and the total successful rate was as high as 95%, making a significant contribution to reducing maternal and infant mortalities and improving the obstetric quality. According to SSCLF-Safety for Mothers and Infants Fund chairman Qiu Haining, the Shanghai Soong Ching Ling Foundation, founded in 1986, has been persistently committed to the public welfare cause of maternal and child health care, and established “Safety for Mothers and Infants” project in 2001 with "Mothers’ Safety and Children’s Health" as the theme. The project has established maternal and children’s healthcare clinics in poor and remote areas in Western China, equipped the clinics with basic medical equipment, held workshops to train local medical workers, promote scientific fertility methods, financially supported free delivery for local pregnant women, in order to protect the health of women and children. The establishment of Renji Hospital Critically Ill Obstetrical Base helps to find those most needy and critically ill pregnant women, to make the most reasonable use of raised money. Respectively as "A Loving Ambassador of Safety for Mothers and Infants" project and "A Loving Ambassador of Renji Hospital, Oriental TV host Chen Chen and the Olympic swimming champion Zhuang Yong attended the inauguration ceremony, and they called for more caring people to join the public welfare causes of caring for the safety of Mothers and infants.